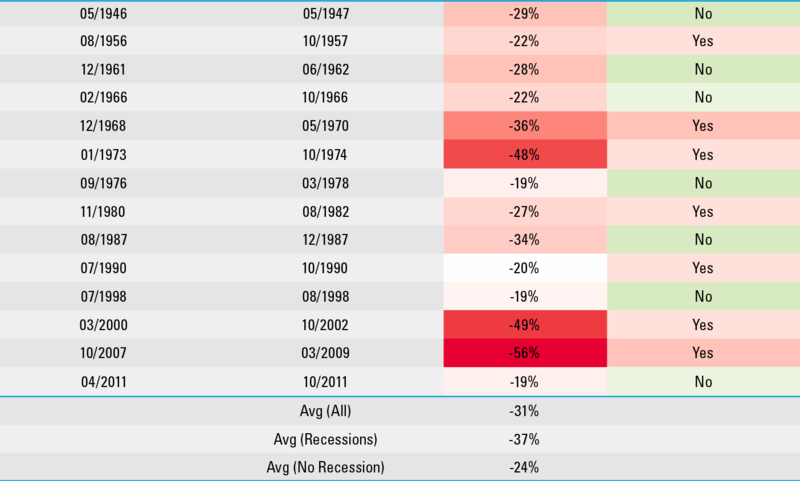 We take some liberty with the 20% bear market definition and count 19% drawdowns based on closing prices in this analysis. These drawdowns were 20% based on intraday prices. The modern design of the S&P 500 stock index was first launched in 1957. Performance back to 1950 incorporates the performance of predecessor index, the S&P 90.All indexes are unmanaged and cannot be invested into directly. All performance referenced is historical and is no guarantee of future results. All indexes are unmanaged and cannot be invested into directly. All performance referenced is historical and is no guarantee of future results. The economic forecasts set forth in the presentation may not develop as predicted.